Background: Placenta previa complicates 0.3–0.5% of all pregnancies and is a major cause of third-trimester hemorrhage which is on the rise due to rise in incidence of cesarean sections. Significant maternal morbidity in form of increased incidence of fetal malpresentation, cesarean delivery, increased blood loss, and peripartum hysterectomy have been noted in cases of placenta previa and can lead to prolonged hospitalization in these women. Premature deliveries can occur which lead to higher admission to neonatal intensive care unit and stillbirths. Aim: To study all cases of placenta previa in scarred and unscarred uterus clinically. Materials and Methods: A retrospective study of 80 cases derived from case records, divided into two groups — A (scarred uterus) and B (unscarred uterus), was conducted in Department of Obstetrics and Gynecology at Mamata General Hospital, Khammam, over a period of 5 years from June 2011 to May 2016. 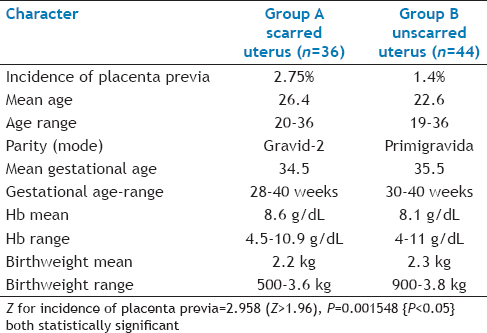 Results: Incidence of placenta previa in scarred uterus (A) was 2.75% which was much higher than in unscarred uterus (B) - 1.4% [P value 0.001]. Anterior placenta was seen in 63.8% in group-A and 47.7% in group-B. P value for Type IIIA placenta previa was statistically significant [0.02]. Placenta was adherent in 13.9% of group-A and 4.5% of group-B. Obstetric hysterectomy was performed in 19.4% of group-A and 4.5% of group-B [P-value 0.01]. Conclusions: Incidence of placenta previa and its associated complications is definitely more in scarred group when compared to unscarred group although statistically significant values were obtained only in incidence of placenta previa, especially type III anterior and rate of hysterectomy. Placenta previa is an obstetric complication in which the placenta is inserted partially or wholly in the lower uterine segment. It is a leading cause of antepartum hemorrhage (vaginal bleeding) affecting approximately 0.4–0.5% of all pregnancies. Maternal complications of placenta previa are—antepartum hemorrhage, adherent placenta, postpartum hemorrhage (PPH), shock, and peripartum hysterectomy causing significant maternal morbidity which can lead to prolonged hospitalization in these women. The fetal complications are intrauterine growth restriction (IUGR) (15% incidence), premature delivery and death. Premature deliveries and IUGR lead to higher admission to neonatal intensive care unit and stillbirths. Altogether 80 cases of placenta previa were studied retrospectively from case records at Mamata General Hospital, Khammam over a period of 5 years from June 2011 to May 2016. They were divided into two groups—A) placenta previa in scarred uterus (36 cases), i.e., any previous uterine surgery or curettage and B) unscarred uterus (44 cases). Baseline characteristics like age, gestational age, hemoglobin, and baby birthweight were studied in terms of their “mean”. Mode was calculated for parity. Type of placenta previa, maternal, and fetal complications and number of blood transfusions were analyzed in terms of frequency distribution and statistically compared by calculation of “z” and “P” values. Out of 4362 deliveries 80 had placenta previa with an incidence of 1.8% in present study. 1308 were women with scarred uterus in whom 36 (2.75%) had placenta previa. Amongst the rest, i.e., 3054,44 (1.4%) had placenta previa. This was highly significant [P = 0.001]. As shown in [Table 1], mean age of group-A was 26.4 years with a range of 20–36 years, while mean age of group-B was 22.6 years with a range of 19–36 years. Most women of group-A were gravida-2 while in group-B most of them were primigravidas. In group-A, mean gestational age at delivery was 34.4 weeks, with a range of 28–40 weeks. In group-B, it was 35 weeks and 30–40 weeks respectively. Mean hemoglobins were 8.6 g/dL and 8.1 g/dL in groups A and B respectively. Mean birthweight in group-A was 2.2 kg with a range of 500 g–3.5 kg while that in group-B was 2.3 kg and 900 g–3.8 kg respectively. [Table 2] shows that in group-A, 13.9% had type-IA placenta previa, 2.8% had type IB, type IIA-27.8%, type IIB-13.9%, type III A-22.2%, type IIIB-5.5%, typeIV-13.9%. In group-B, type IA was present in 18.2%, type IB-0, type IIA-22.7%, type IIB-25%, type-IIIA-6.8%, type IIIB-9.1%, and type IV-18.2%. Overall anterior placenta was seen in 63.8% in group-A and 47.7% in group-B. Both “z” and “P” values for type IIIA placenta previa were statistically significant [P = 0.02]. Antepartum hemorrhage was presenting feature in 86.1% of group-A and 88.6% of group-B while 19.4% and 18.2% presented with shock in group-A and group-B respectively as seen in [Table 3]. 19.4% and 11.4% had severe anemia in group-A and group-B respectively. The rate of emergency lower segment cesarean section (LSCS) was 72.2% in group-A and 84.1% in group-B. 44.4% of group-A were complicated by PPH while 34.1% had PPH in group-B. Placenta was adherent in 13.9% of group-A and 4.5% of group-B. Hysterectomy was performed in 19.4% of group-A and 4.5% of group-B which had statistically significant “z” and “P” values[P = 0.01]. Disseminated intravascular coagulation (DIC) with maternal death occurred in 2.8% of group-A and 4.5% of group-B. Requirement for three or more transfusions was present in 22.2% and 6.8% of groups A and B respectively. [Table 4] shows that malpresentations like breech and transverse lie were seen in 16.7% and 18.2% of groups A and B respectively. 61.1% of group-A and 63.6% of group-B had preterm delivery. Babies were born with low birthweight in 63.8% of group-A and 70.4% of group-B. Perinatal death occurred in 11.1% and 6.8% of groups A and B respectively. Placenta previa occurs approximately one of every 250 births. One third of all antepartum hemorrhage occurs due to placenta previa. It has been suggested that incidence of placenta previa is increasing due to increased rate of cesarean section. Overall incidence of placenta previa in present study was 1.8% of total deliveries, which was higher than 0.73% (Bahar et al. ), 0.76% (Meena et al. ), and 0.82% (Purvi et al.) because the present study was undertaken in a tertiary referral hospital. Incidence of placenta previa in group-A (scarred uterus) was 2.75% which was much higher than in group-B (unscarred uterus)—1.4% in present study, similar to many studies.,,,, Similarly, in a study by Purvi et al., the incidence was 1.14% in scarred uterus and 0.49% in unscarred uterus. The incidence of placenta previa was also higher in women with previous cesarean section as compared to those with no previous uterine scar, i.e., 1.33% and 0.47% respectively in a study by Katke RD. The reported incidence of placenta previa in a meta-analysis  ranged between 0.28% and 2.0%, or approximately 1 in 200 deliveries. Women with at least one prior cesarean delivery were 2.6 (95% confidence interval 2.3 to 3.0) times  at greater risk for development of placenta previa in a subsequent pregnancy. Prior cesarean delivery increased the incidence from 1.9% with two prior cesareans to 4.1% with three or more according to a study by Sarojini et al. Exact cause of placenta previa is unknown. It is hypothesized to be related to abnormal vascularization of endometrium caused by scarring or atrophy from previous trauma, surgery, or infection. These factors may reduce differential growth of lower segment, resulting in less upward shift in placental position as pregnancy advances. The risk factors for placenta previa are—previous placenta previa (recurrence rate 4–8%), cesarean delivery, myomectomy or endometrium damage caused by D & C, women younger than 20 and older than 35, alcohol use, multiparity, smoking, cocaine use, large placentae from twins or erythroblastosis and placental pathology (velamentous insertion, succinturiate lobes, bipartite, i.e., placenta etc.). Placenta previa is itself a risk factor of placenta accreta. In present study, baseline characteristics like mean age of the woman, mean gestational age, mean hemoglobin, mean birthweight were comparable in both the study groups, although mean age was lesser in group-B (22.6 years) compared to group-A (26.4 years) because most of the study population in group-B was primigravida in comparison to gravida-2 in group-A. In a study by Katke RD, maximum number of women in both scarred (53.3%) and unscarred groups (48%) were between 25 years and 30 years of age. Same study shows that increasing parity increases the risk of placenta previa, Para 1 or more were 100% in scarred uterus and 72% in unscarred uterus. In the last trimester of pregnancy the isthmus of the uterus unfolds and forms the lower segment. In a typical pregnancy the placenta overlies the upper segment of uterus. If the placenta does overlie the lower segment, as is the case with placenta previa, it may shear off during formation of lower segment and a small section may bleed. Women with placenta previa often present with painless, bright red vaginal bleeding. This commonly occurs around 32 weeks of gestation, but can occur as early as late mid-trimester. This bleeding often starts mildly and may increase as the area of placental separation increases. Previa should be suspected if there is bleeding after 24 weeks of gestation. Diagnosis is by history which reveals antepartum hemorrhage. Abdominal examination usually finds the uterus nontender, soft, and relaxed. Leopold's maneuvers may find the fetus in an oblique or breech position or lying transverse as a result of the abnormal position of the placenta. Malpresentation is found in about 35% cases. Vaginal examination is avoided in known cases of placenta previa. Previa can be confirmed by an ultrasound. Transvaginal ultrasound has superior accuracy as compared to transabdominal one, thus allowing measurement of distance between placenta and cervical os. Incidence of antepartum hemorrhage and shock in present study was same in both the groups but severe anemia was more in scarred group may be because of multiparity, adherent placenta, and PPH. However, mean hemoglobin in group-B (8.1 g/dL) was lesser than in group-A (8.6 g/dL) as most of the women in group-B presented as emergencies. In present study, incidence of anterior placenta previa in group-A (63.8%) was higher than in group-B (47.7%) similar to a study by Purvi et al. where 60.7% of scarred uterus group had anterior placenta previa compared to 36.3% in unscarred group, which supports the theory of abnormal vascularization. Similarly, in a study by Katke RD, significantly higher number (66.7%) of cases had anterior previa in scarred uterus and only 32% cases in unscarred uterus (P value = 0.03 S). This is comparable to that found in the study by Gayatri et al., where 85.3% had anterior placenta in scarred uterus and 36.8% in unscarred uterus. In present study, incidence of type III anterior placenta previa had statistically significant “z” and “P” values [P = 0.03]. The mode of delivery is determined by clinical state of the mother, fetus, and ultrasound findings. In minor degrees (traditional grade I and II), vaginal delivery is possible. Royal College of Obstetricians and Gynaecologists (RCOG) recommends that the placenta should be at least 2 cm away from internal os for an attempted vaginal delivery. When a vaginal delivery is attempted, consultant obstetrician and anesthesiologists are present in delivery suite. In cases of fetal distress and major degrees (traditional grade III and IV) a cesarean section is indicated. Cesarean section is contraindicated in cases of DIC. An obstetrician may need to divide the anterior lying placenta. In such cases, blood loss is expected to be high and thus blood and blood products are always kept ready. Overall rate of LSCS in present study was 95.5%, with vaginal deliveries being 4.5%, all in unscarred group. However, rate of emergency LSCS was more in unscarred group (84.1%) than scarred group (72.2%) because many (27.8%) delivered by elective LSCS in scarred group. 91 (85.8%) cases delivered by cesarean section and 15 (14.2%) cases were delivered by vaginal route in a study by Sarojini et al. Placenta was adherent in 13.9% of group-A and 4.5% of group-B in present study. In a study by Katke RD, incidence was 6.7% and 2.5% respectively. In a study by Purvi et al., 10.1% had morbidly adherent placenta in scarred uterus. The risk of adherent placenta increases to 11%, 40%, and 61% with previous one, two, or three cesarean section. Adherent placenta in association with placenta previa and previous cesarean section has clinical significance because of rising cesarean section rates all over the world. Management of morbidly adherent placenta previa is challenging and requires a team approach and there are very high chances of cesarean hysterectomy. Maternal morbidity in terms of PPH was greater in scarred group (44.4%) than in unscarred group (34.1%) in present study because of increased incidence of adherent placenta, though result was not statistically significant. In a study by Purvi et al., PPH and requirement of skilled surgical procedures like bilateral hypogastric artery ligation, compression suture technique, cesarean hysterectomy, and bladder injury repair were significantly higher (P value) in scarred group patients compared to unscarred group patients. In present study, compression suture was successfully applied in 13.9% of scarred group and 9.1% of unscarred group. Hysterectomy was performed in 19.4% of group-A and 4.5% of group-B which was statistically significant [0.01]. One patient in unscarred group underwent stepwise devascularization. 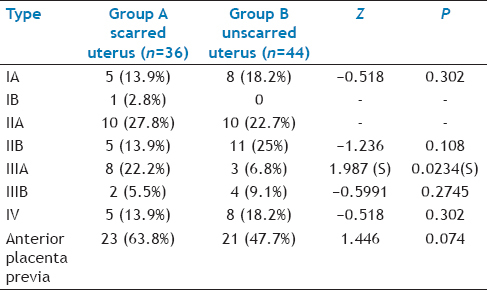 In a study by Katke RD, 6.7% of scarred group required obstetric hysterectomy compared to no case in unscarred group. An initial assessment to determine the status of the mother and fetus is required for management. Immediate delivery of the fetus may be indicated if the fetus is mature or if the fetus or mother are in distress. Blood volume replacement (to maintain blood pressure) and blood plasma replacement (to maintain fibrinogen levels) may be necessary. The corticosteroids are indicated at 24–34 weeks' gestation if the patient has bleeding, given the higher risk of premature birth. Once bleeding stops expectant management initiated. DIC with maternal death occurred in 2.8% of group-A and 4.5% of group-B. There was no maternal death in studies by Katke RD  and Ahmed et al.. This was because present study was conducted in a tertiary hospital, where patients arrived very late, in a critical condition. Rate of blood transfusions ≥3 was also greater in scarred group (22.2%) than in unscarred group (6.8%) in present study. Similarly, number of blood and component transfusions required were also higher in placenta previa with scarred uterus in a study by Purvi et al. In a study by Katke  33.3% of scarred group required blood transfusions compared to 24% of unscarred group. Perinatal morbidity and mortality in terms of malpresentations, prematurity, low birthweight, and perinatal death were similar in both groups in present study in contrast to a study by Purvi et al. where fetal morbidity and mortality was higher in scarred group. There was no significant difference (61.1% of group-A and 63.6% of group-B) in rate of preterm delivery in present study. However, 66.7% women had preterm births in scarred uterus group as compared to 20% in unscarred group (P = 0.003, HS) in a study by Katke. Similar results were found by Gayatri et al. where incidence of babies delivered at <37 weeks of gestation was 58% in scarred and 47% in unscarred group. Perinatal mortality rate of placenta previa is 3–4 times higher than normal pregnancies. Perinatal death occurred in 11.1% and 6.8% of groups A and B respectively (no significant difference), in present study. There were no stillbirths in a study by Katke, as compared to 13.2% in a study by Ahmed et al. However, incidence of stillbirths was 9% and 24% in scarred and unscarred group in the study by Gayatri et al. Incidence of placenta previa and its associated complications is definitely more in scarred group when compared to unscarred group although statistically significant values were obtained only in terms of incidence of placenta previa, especially type III anterior and rate of hysterectomy. So, primary prevention in the form of reduction in the rate of primigravida cesarean section must be done in order to prevent likelihood of placenta previa in scarred uterus and its associated morbidity. Early diagnosis by ultrasound and planned delivery should be the goal in both groups. We are thankful to our head of the department for permitting us to carry out the study. Bahar A, Abusham, Eskandar M, Sobanda A, Alsunaidi M. Risk factors and pregnancy outcome in different types of placenta previa. J Obstet Gynaecol Can 2009;31:126-31. Meena N, Dave A, Meena S, Meena A, Shrivastava A. Impact of placenta previa on obstetric outcome. Int J Reprod Contracept Gynaecol 2015;4:76-80. Purvi M Parikh, Shailesh Makwana, Sapana Shah, Vivek Vithalani. Feto-Maternal Outcome in Placenta Previa in Scarred Uterus Vs Non Scarred Uterus. IOSR Journal of Dental and Medical Sciences (IOSR-JDMS) e-ISSN: 2279-0853, p-ISSN: 2279-0861. Volume 15, Issue 1 Ver. I (Jan. 2016), PP 69-73. To WW, Leung WC. Placenta previa and previous cesarean section. Int J Gynaecol Obstet 1995;51:25-31. Getahun D, Oyelese Y, Salihu HM, Ananth CV. Previous cesarean delivery and risks of placenta previa and placental abruption. Obstet Gynecol 2006;107:771-8. Yang Q, Wen SW, Oppenheimer L, Chen XK, Black D, Gao J, et al. Association of caesarean delivery for first birth with placenta praevia and placental abruption in second pregnancy. BJOG 2007;114:609-13. Ananth CV, Smulian JC, Vintzileos AM. The association of placenta previa with history of cesarean delivery and abortion: A metaanalysis. Presented at the Seventeenth Annual Meeting of the Society of PerinatalObstetricians, Anaheim, California, January 20-25, 1997. New Brunswick, New Jersey. Am J Obstet Gynecol 1997;177:1071-8. Katke RD. Placenta previa: Outcomes in scarred and unscarred uterus. Int J Reprod Contracept Obstet Gynecol 2016;5:2728-32. Sarojini, Malini KV, Radhika. Clinical study of placenta previa and its effect on maternal health and fetal outcome. Int J Reprod Contracept Obstet Gynecol 2016;5:3496-9. Mathuriya G, Lokhande P. Comparative study of obstetric outcome between scarred and unscarred uterus in placenta previa cases. Indian J Clin Pract 2013;24. ACOG committee on Obstetric Practice. ACOG committee opinion. Number 266, Jan 2002: Placenta Accreta. Obstet Gynecol 2002;99:169-70. Ahmed SR, Aitallah A, Abdelghafar HM, Alsammani MA. Major Placenta Previa: Rate, Maternal and Neonatal outcomes experience at a Tertiary Maternity Hospital, Sohag, Egypt: A prospective study. J Clin Diagn Res 2015;9:QC17-9.